We wanted to make you aware of a deeply worrying and unpleasant crime that is currently taking place in and around Richmond in order that you can be more aware and also alert your more vulnerable or elderly neighbours. Once upon a time, long before estate agents roamed the earth; when Michael Gove was just a figment of our imagination, this blessed plot of ours was noted for many things like wheat, fruit, pottery, fish, beer, gunpowder and surprisingly - swords. 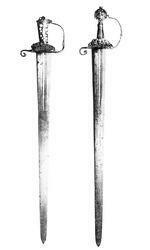 It is recorded that in the late 16th century, during the reign of Elizabeth 1st, those who wished to rent land near the Rivers Colne and Crane for the construction of gunpowder mills had to pay the Government a rent of 1000 swords… which sounds a little cut throat to me! 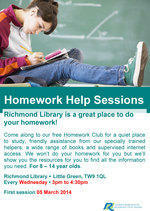 Richmond Library is a great place to do your homework! Come along to our free Homework Club during term-time for a quiet place to study, friendly assistance from our specially trained helpers, a wide range of books and supervised internet access. We won’t do your homework for you but we’ll show you the resources for you to find all the information you need. For 8 - 14 year olds. 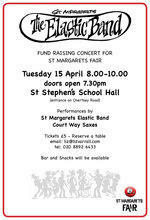 Come along to a fund raising concert for the St Margarets Fair, who supports four local schools, three local charities chosen by the St Margarets Fair committee. The concert is at St Stephens School on 15 April 2014 from 7.30. ‘Complete Beginners Yoga Course’ voted favourite adult class in Richmond area. A St Margarets ‘Complete Beginners Yoga Course’ has scooped one of the top awards in the ‘Classes For You’ competition, run by Britain’s biggest parenting site Netmums. “The Real Wine Month” is a nationwide promotion highlighting organic, biodynamic and natural wines made by artisan growers and winemakers. News about the First World War Belgian refugees across the border in East Twickenham has now hit the headlines, but the story of the refugees in St Margarets is still to be told. If East Twickenham was the hub of the Belgian community, then St Margarets and adjacent parts of Central Twickenham were its perimeter. Regular readers of this website already know that our little corner of Paradise sits on the southern edge of what was the most dangerous 4,000 acres of open countryside in the entire kingdom. In its time Hounslow Heath was the favoured haunt of footpads, robbers and highwaymen and the most handsome, the most charming, the most dashing of them all was the roguish Claude Duval. Huzzah! Many parents need support, friendship or advice when their children are young. We train volunteers with parenting experience in the Richmond area who can visit you at home. They can give you a helping hand and listen to your concerns. All are DBS (CRB) checked and fully trained.